Denver drone artist Radere took over Counterpath for an evening of light and sound, joined for this event by fellow Colorado sound artists offthesky and Cody Yantis, with whom he has recently begun a new collaborative project. Radere is the alias of Carl Ritger, a sound artist currently living and working in Denver, Colorado. Inspired by notions of stasis and chance, he has explored the intersections between traditional instrumentation, synthesis and experimental processes for the better part of the last decade, blurring guitars, location recordings and electronics into densely textured washes of sound. Since 2003, Radere has released work for labels around the world, including Full Spectrum, Moodgadget, basic_sounds and Futuresequence. In addition to his solo effors, he has worked with Offthesky, Sun Hammer, Ten And Tracer, Andrew Weathers, Christopher Willits and Coppice Hallifax; as well as Anduin, with whom he conducts the Andere project. Jason Corder — a.k.a. offthesky — is part producer, video artist, and sonic spelunker. For the past decade he has released over 30 albums on various labels including 12k’s term, Home Normal, Hibernate and Zymogen. He is constantly evolving his many projects, which include color cassette, juxta phona and the writing life, alongside his offthesky moniker. Apart from producing, he spends his free time developing interactive installations, performing live A/V and collaborating with artists from around the globe. Jason grew up in Lexington, Kentucky though now resides in Denver. Cody Yantis, a Coloradan, has lived in the Pacific Northwest, New York City, and Dublin. 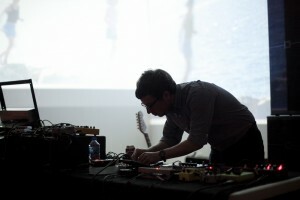 Primarily guitar-based, his works also employ various other sources of sound, such as the saxophone and field recordings. The results are often instrumental and free-form, and they tend to reside in those grey-areas where tonal/melodic elements drift toward noise. Experiences and ideas of environment provide consistent motivations as Yantis explores what David Teague has called “people suiting posture to place.” A member of Saguache and Tilth, he also writes and works in visual media. This event is free to the public, though donations will be encouraged to support the artists.